These 1/16" white Coverbind Go-Green full wrap covers meet the high standards of the eco-friendly range of products available on MyBinding. They are FSC certified, harvested from sustainable forests, and are made with 100% renewable energy. The materials used to make this cardstock front and back cover are unbleached and chlorine free. There is a strong adhesive and book binding fabric strip in the spine, both of which are unique to Coverbind thermal binding covers. The 1/16" size holds up to 15 sheets of 20 bond paper and come in a pack of 100 per carton. These white covers are sold under part number 676101 (MyBinding part number CB676101 ).Promotional Pricing: Limited time only! Welcome to MyBinding video. 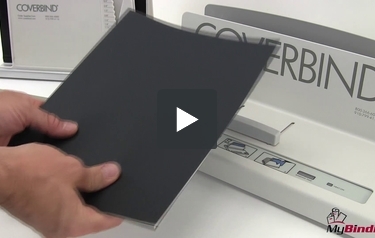 This video looks at CoverBind's Go Green Full Wrap Thermal Covers. This is one of the many items that exemplify the high environmental standards here at MyBinding. With the adhesive built right into the spine, CoverBind folders are easy to use. Just load the inside into the outside and bind away. These Go Green covers are FSC certified and made with 100% renewable energy and are harvested from sustainable forests. These Go Green covers work great with all CoverBind thermal binding systems and the card stock from which they're made is unbleached and chlorine free and even though it's green, it still holds the bind fast. That the Go Green Full Warp Thermal Cover by CoverBind. For more demos, reviews and how to's, check out MyBinding.com.